Unexpected high temperatures and sunshine warmed the packed grandstands, who were entertained before the polo began by Karabakh riders performing their display ‘Land of Fire’ with the Karabakh mountain stallions in an exhilarating, acrobatic, Cossak style display, accompanied by the Sarhadchi dance ensemble complete with their flowing green robes and bejewelled headdresses. VIPs mingled with members of the public, enjoying the beauty of the Engadin Valley, sipping on Royal Salute whisky and Perrier Jouët champagne. 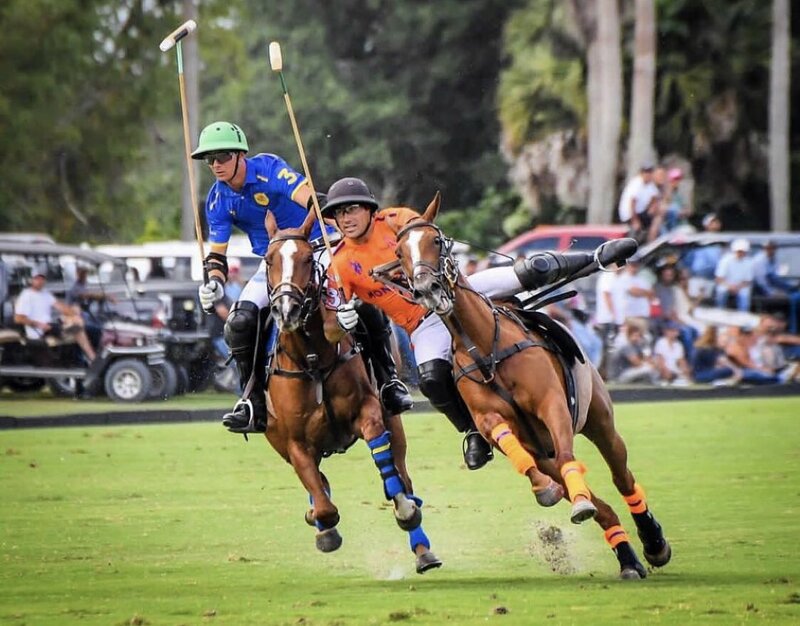 Day two of thrilling polo action saw a somewhat unusual game between Melissa Ganzi’s Badrutt’s Palace and Azerbaijan Land of Fire. Before the starting whistle, the upheaval had already begun as Germany’s premier player, the flamboyant Thomas Winter replaced Isidro Strada due to illness; this meant they started with a 11⁄2 goal advantage. The change did not impact too much as they opened the scoring and looked confident in attack in the first chukka. But their luck was to run out as Adrian Laplacette, the 6 goal cornerstone of their strategy as the highest handicapped player on their team, suffered a badly cut ear and was rushed to hospital. Min Podesta replaced him and so a goal was taken off the score to reflect the handicap difference. Podesta and the team battled on valiantly but the flow and cohesion was lacking, despite flashes of brilliance from Elchin Jamalli, Agustin Kronhaus and the ever crowd pleasing, Thomas Winter. Meanwhile, Badrutt’s Palace Alejandro Novillo Astrada had really found his form today, appearing here, there and everywhere, scoring goals and shutting down the efforts of the Azerbaijan white shirts so that by the half-time bell, Badrutt’s Palace had secured a narrow 4- 21⁄2 lead. The drama continued into the second half as Novillo Astrada’s flamboyance ended with a tumble and suspected broken arm, but luckily for his team, he was back on board after medical attention with nothing more than a bad bruise. Whistle and yet more whistle was the name of the game for the rest of the chukka, reflecting the players’ ferocity and passion on the ice, both teams clearly determined to win and secure their slot in tomorrow’s Grand Final. The game was still anybody’s for the taking at the end of the third chukka at 5-31⁄2 still in Badrutt’s favour. Astrada. After nearly 11⁄2 hours of epic battle, Badrutt’s Palace emerged battered, bruised but ultimately victorious with a convincing final score of 7-3 1⁄2 for The Maserati Cup. 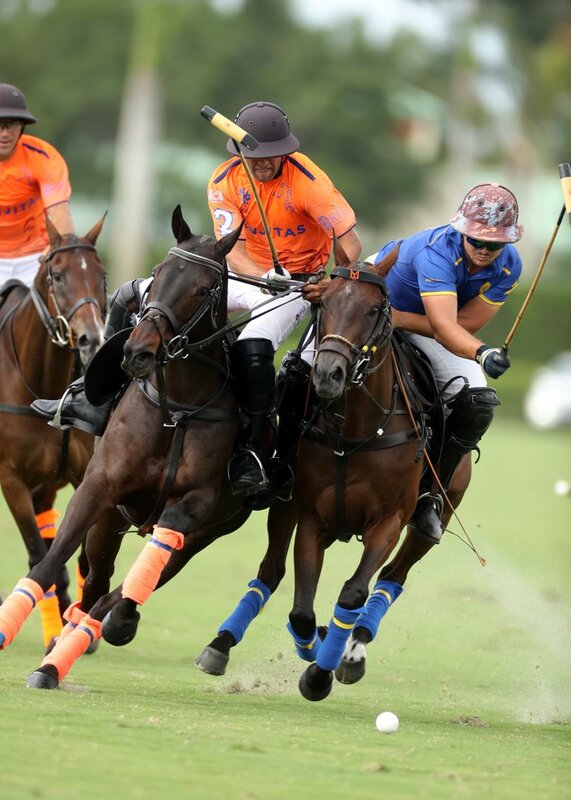 The day’s second match was a much smoother affair as Maserati came up against 2018 champions Cartier for The Deutsche Bank Wealth Management Challenge Trophy, both seeking that coveted spot in the Final. 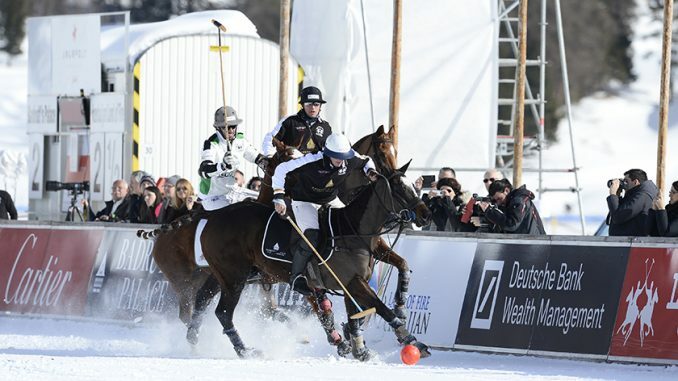 Maserati began the match with a half goal handicap advantage, but it became apparent early in the first chukka that the expert British pairing of Chris Hyde, looking for his eighth Snow Polo World Cup St. Moritz win, and Max Charlton was going to be a force to be reckoned with. 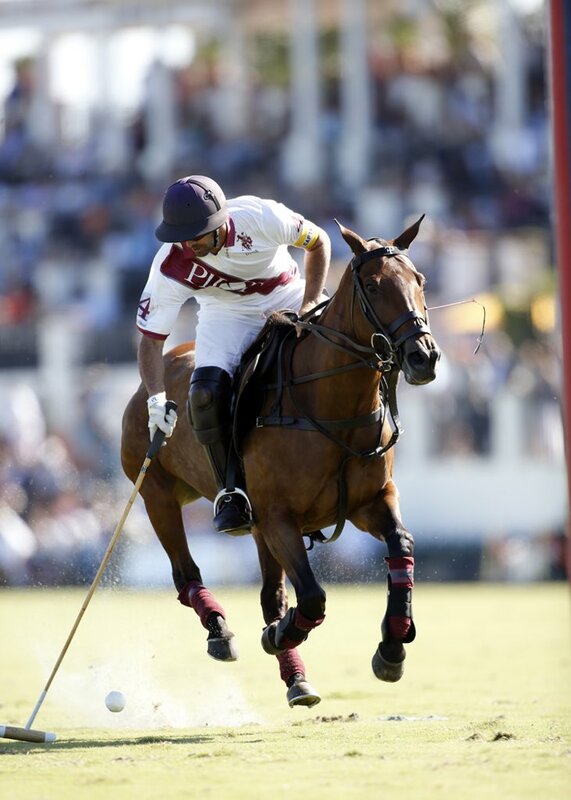 Both sticking to 10 goal powerhouse Juan Martín Nero, they scored a goal apiece to begin Maserati’s challenge. 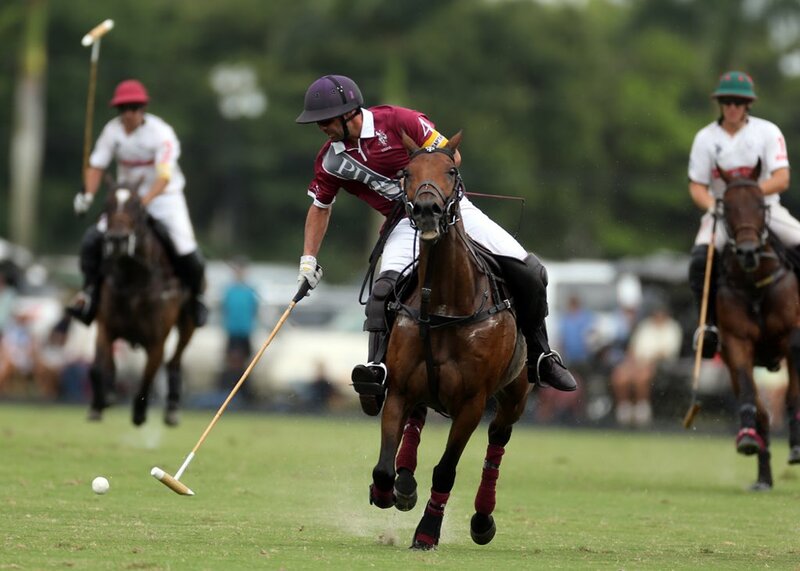 The ride-offs were forceful and the play fast, but Nero ensured Cartier were in the game at all times, ending the chukka only a goal and a half behind, 31⁄2-2. Frenchman Robert Strom came into his own in the second chukka, scoring two goals and dancing around the red shirts like they were slalom poles. Going into the second half, tensions were rising with the 2018 champions unwilling to give up just yet. Following a couple of missed penalties, Nero secured the first of two phenomenal 50 yard neck shots that seemed almost unbelievable as they sailed through the uprights. The final chukka was all to play for, with the teams sitting at 71⁄2-5 in Maserati’s favour. Nero narrowed the scores even further with an easy 30 yard penalty, but with only 11⁄2 minutes remaining and an open goal, it seemed like Nero might clasp the win for Cartier, but Charlton in a move unique to his style of play, snuck a hook out of nowhere, scuffling Nero’s last attempt on goal and secured a spot in The Snow Polo World Cup St. Moritz Final for Maserati 71⁄2-6. For the first time in The Snow Polo World Cup’s history, a female player will take to the snow polo field for the Final, as Melissa Ganzi’s Badrutt’s Palace come up against 2017 winners Maserati for the coveted trophy, which will take place at 2.15pm tomorrow. 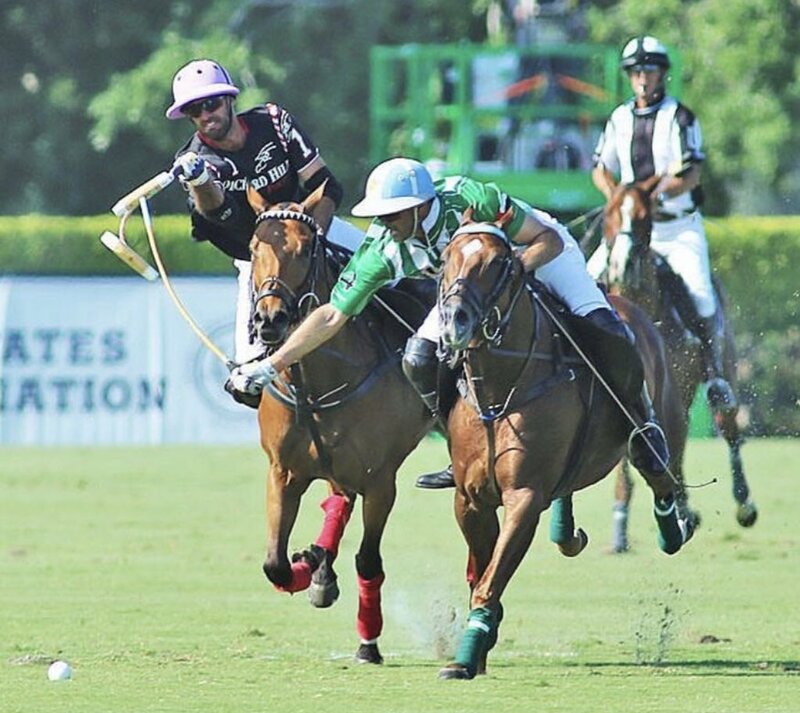 Prior to the Final, Cartier will face Azerbaijan Land of Fire in The Subsidiary Final for The La Martina Cup at 12pm. With all to play for, the question on everyone’s lips is will Melissa Ganzi become the first female player to win The Snow Polo World Cup or will Chris Hyde secure his eighth title on the St. Moritz snow? Watch this space!